The entrance of your home can make or break the impression your friends and family have about you. It is after all an indication of the aesthetic quality of your interiors, and speaks volumes about your taste and personality. So here we bring you 13 brilliant ideas for entrance designs which can add a whole new edge to your home. From rustic to ultramodern and sober to vibrant… glean design inspiration from numerous stunning options. 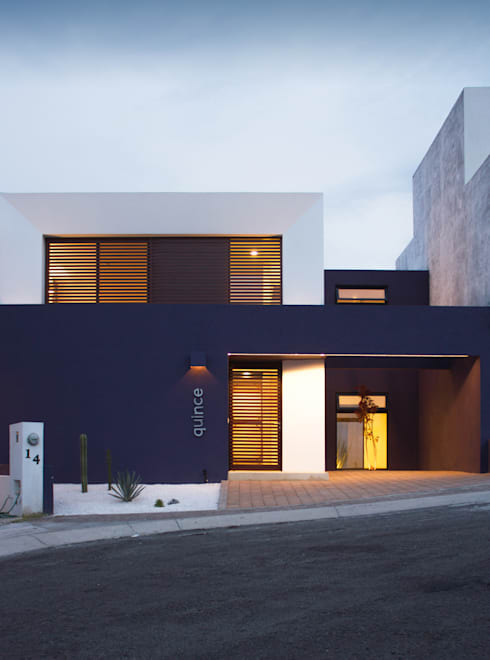 Navy blue and white come together for this elegant facade replete with simple lines. Louvre doors and windows add a unique look to the entrance as well as the upper storey, with a quaint peek-a-boo effect. 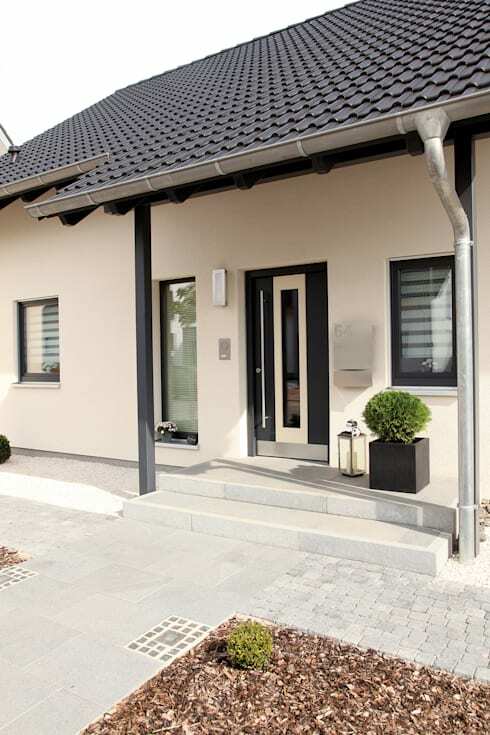 A massive but sleek and smooth wooden door can lend warm pizzazz to your entrance and contrast neutral hues nicely. And when paired with a lush green border, it can look inviting as well as stylish. Lined with pebbles and wooden slabs, this home’s approach celebrates warm and cosy rusticity along with soft recessed lights. The simple wooden door complements the stone wall on the right, while lush greens add a dollop of freshness to the entrance. 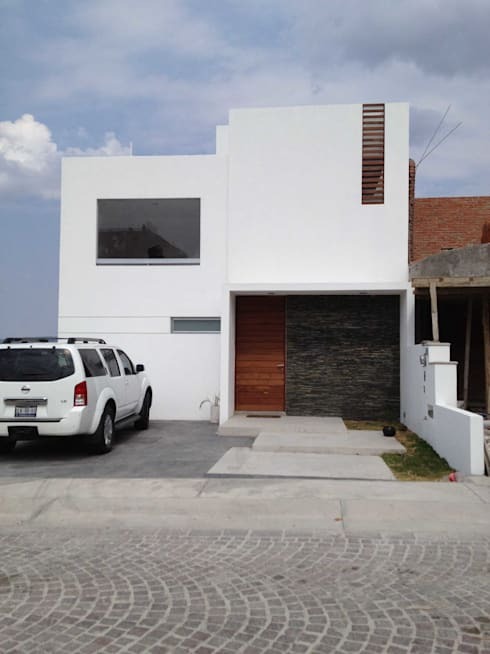 Credit for all of this goes to the architects at LGZ Taller de Arquitectura. 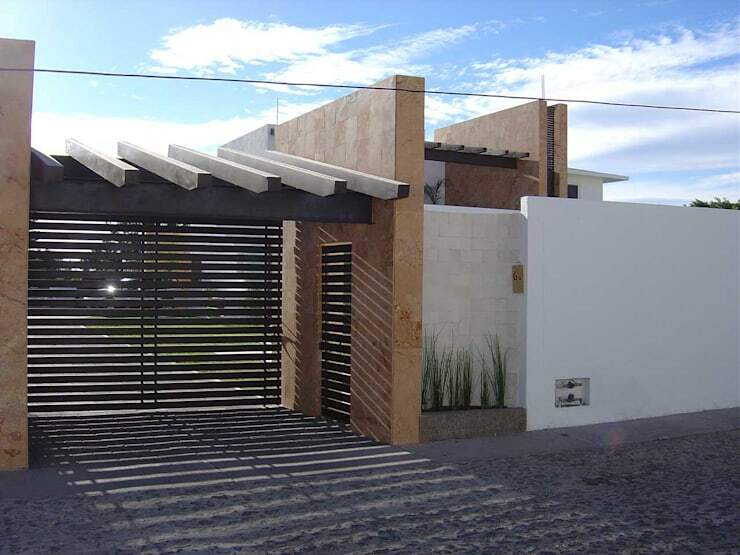 With wooden bars on one side and neat, white stone walls on the other, this entrance delights with intriguing texture as well as colour play. 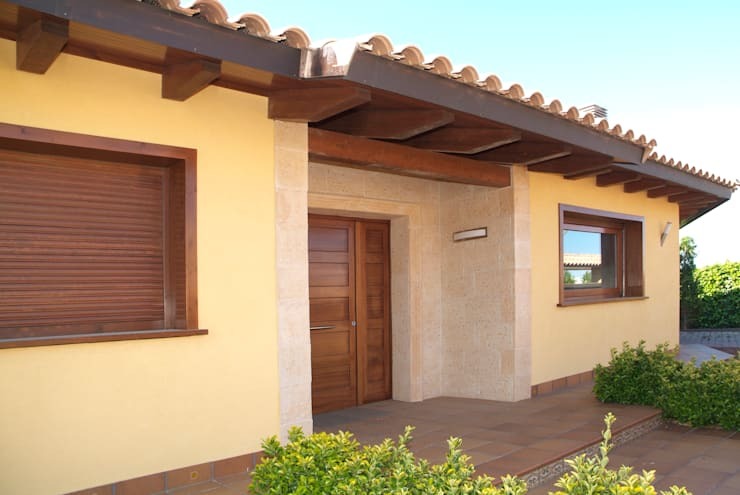 Wooden beams lend shade over the barred gate, while a sandy-hued stone wall projects and partitions the two sides of the entrance. The neat wooden door of this simple yet elegant white abode has been given a cool contrasting touch with the wall clad in grey stones. The difference in texture between stone and wood, and the quirkily placed slabs for the approach make for a unique style statement. Pale yellow walls and pretty wooden door and windows lend a rustic charm to this facade, along with the sandy-hued stone cladding around the entrance. The shingled roof gets structural support from wooden beams, which enhance the house’s overall earthiness, while greenery flanks the approach path for a lively ambiance. 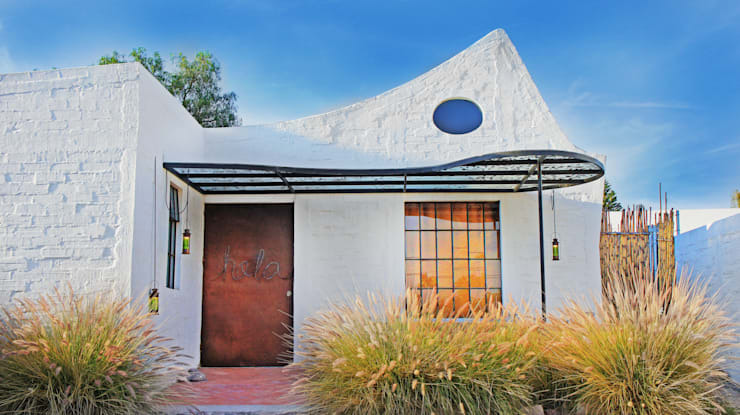 This minimalistic, quaint home with a peaked roof owes its charm to the stylish and artistic entrance. The beautifully designed wrought iron and acrylic pergola decked with bright green lanterns makes for a fashionable and exclusive entrance. And the wooden door looks so cordial with the word “Helo” beckoning you to step inside. The large glass window with its wrought iron frame allows sunlight to flood the interiors, while the busy green bushes add cosiness to the structure. 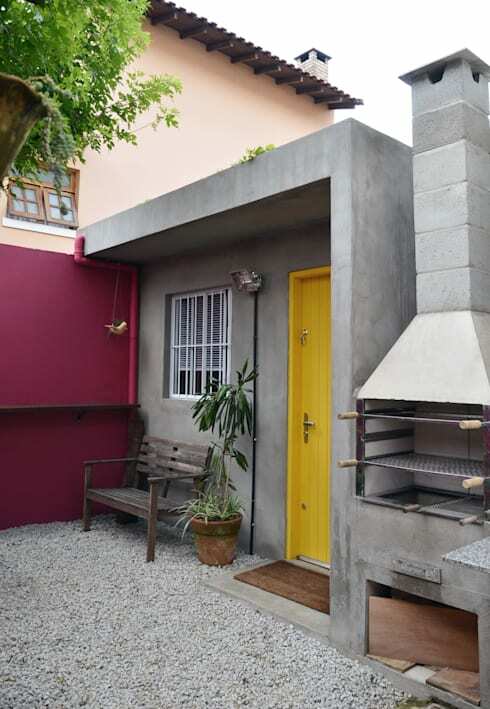 This residence’s entrance thrills visitors with a peppy yellow door and a dark magenta wall that contrast the grey concrete structure wonderfully. A rustic wooden bench, pebbles and a lush potted green offer comfy outdoor seating, while the stylish barbeque promises delicious open air meals. A brick-lined wall meets a splash of buttery yellow for this charming and traditional entrance. 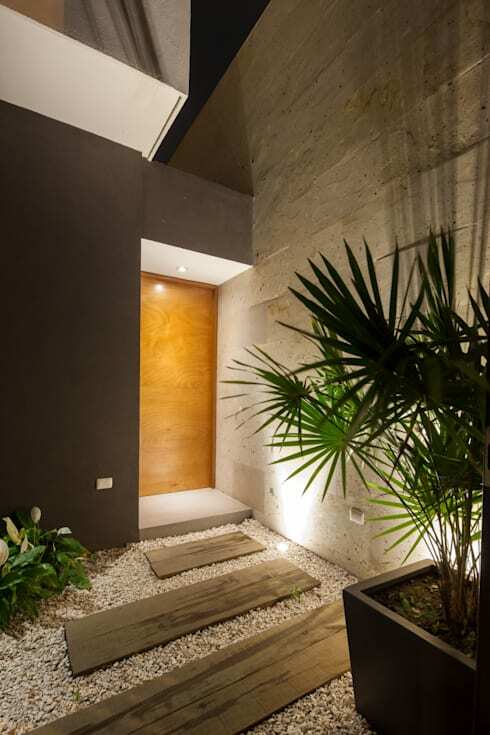 The wooden door looks warm and inviting, while earthy-hued porcelain tiles line the approach and deck the patio aesthetically. Verdant potted plants and a gorgeous blooming creeper add natural magic to this house. White and grey dominate this abode for a simple, elegant and highly contemporary appearance. Neat lines, a smart shingled roof, and classy glass windows can charm any onlooker easily. The door itself is a grey and white affair with chrome detailing and a narrow strip of glass running down its middle. A stylish grey planter holds a nicely pruned bush close by, for some natural relief. Different shades of grey and white make the layered look of this house’s entrance all the more appealing and intriguing. 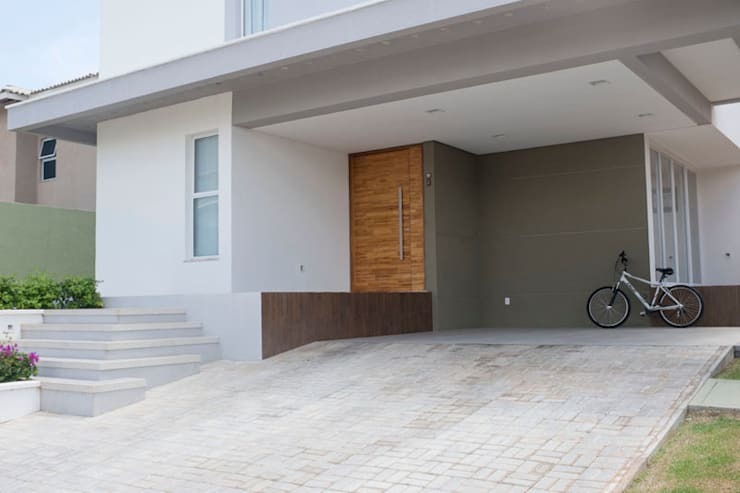 Sleek steps lead you to the neat porch, while the smart wooden door looks graceful and welcoming. 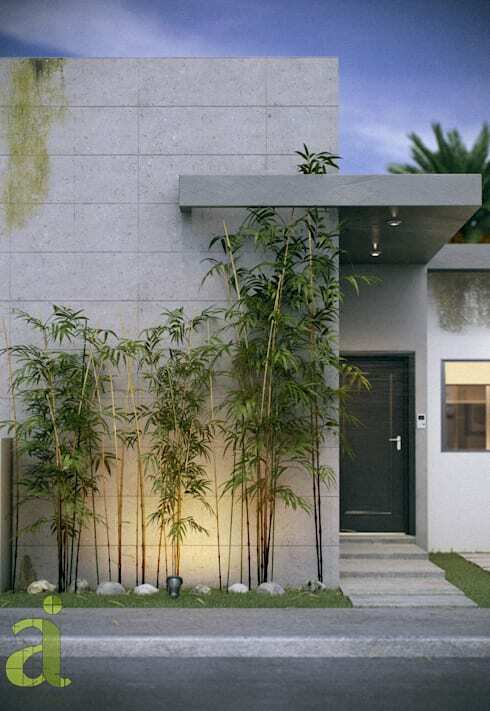 The chic grey concrete of this residence has been given a dash of life with the tall greens and rocks, which pave the way for a cosy entrance. The dark wooden door contrasts the grey environs nicely too. 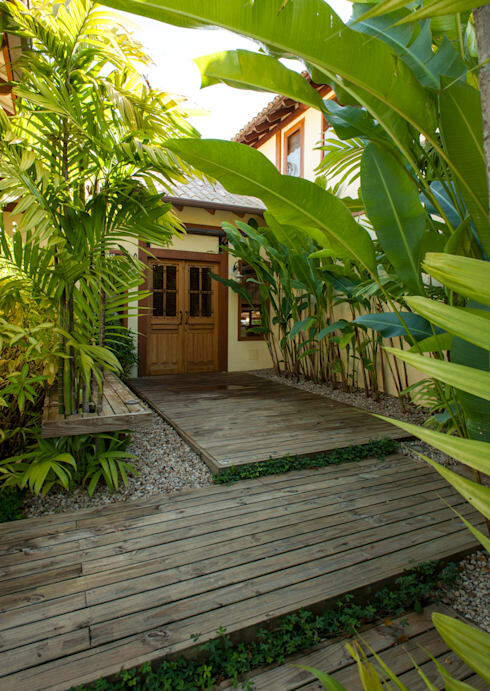 With a wide variety of plants flanking the rustic wood and pebble approach of this house, the entrance looks like a tropical heaven of sorts. While wood and pebbles offer organic respite under your feet, the towering greenery provides soothing shade. The wood and glass door is a quaint piece of work and very welcoming. So pick the idea that appealed to you the most, and create an entrance that wows one and all. 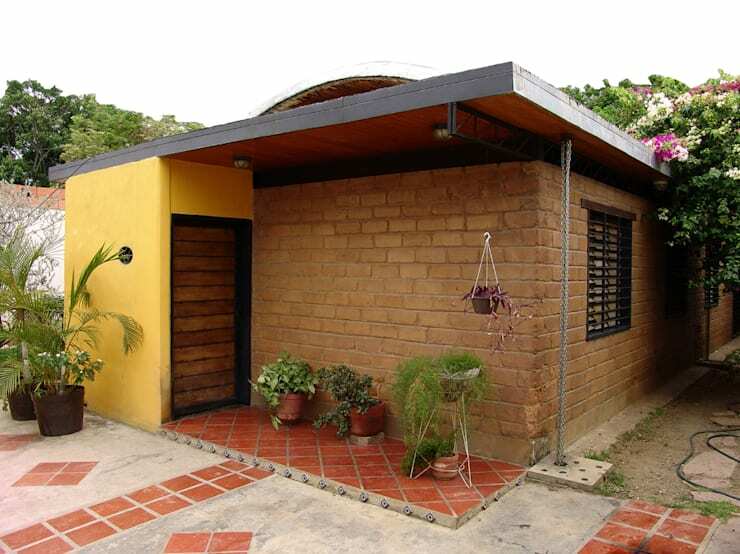 Here’s another story you might like - 8 Beautiful Houses That Were Very Cheap To Build.